James explores three collections marking the 150th anniversary of the composer’s birth, with highlights including Boulez’s P?lleas et M?lisande, Michael Tilson Thomas’s Le Martyre de Saint S?bastien, and Jean-Yves Thibaudet’s Pr?ludes. 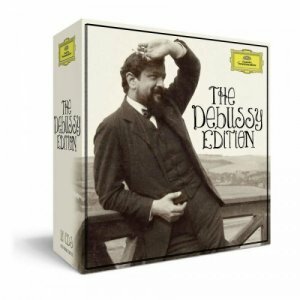 Following our successful Mahler and Chopin editions, this is a joint Deutsche Grammophon/Decca Classics unlimited edition with benchmark Deutsche Grammophon and Decca Classics recordings. All his important works: orchestral (with Pierre Boulez); piano (with Krystian Zimerman, Jean-Yves Thibaudet); opera (Claudio Abbado’s Pell?as et M?lisande); m?lodies (with V?ronique Dietschy); chamber music (with Arthur Grumiaux, Melos Quartet, Lynn Harrell. 04. IV. "Les Sons Et Les Parfums Tournent Dans L'air Du Soir"
09. IX. Hommage A S.Pickwick, Esq. P.P.M.P.C. 07. III. Quelques Aspects De - "Nous N'irons Plus Au Bois"
06. I. Dieu! Qu'il Lafaitbon Regarder!